Piqua, Ohio – January 2, 2013 — Working under a corporate veil of complete secrecy for the past three years, Raisbeck Engineering and Hartzell Propeller have teamed to develop and certify the first business aviation turbine propeller using practical swept-wing theory as an integral part of its design. The effort has culminated in the FAA certification of the Raisbeck/Hartzell Swept Turbofan Propeller for the King Air 200/B200/B200GT. 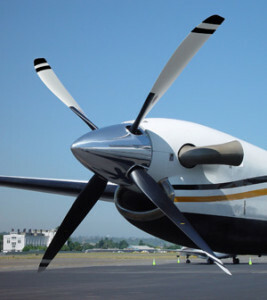 The new Swept Propeller has been added to Raisbeck Engineering’s Airplane Flight Manuals, making it compatible with all combinations of Raisbeck Performance Systems for these aircraft and carrying with it all these systems’ FAA-approved increased performance levels. The swept-back design required a new Hartzell-supplied forging before production could begin. Hartzell is currently in the manufacturing cycle. For development and FAA certification flight testing, blades machined from large aluminum blocks were used. Deliveries commence March 1st, 2013 from Hartzell’s factory near Dayton, Ohio to Raisbeck’s customers of record.